& from Wales / Cymru including Kielder Forest. LED ZEPPELIN Show Souvenir (Incredibly rare 1972 UK 12 page programme for their Winter 72/73 UK tour with biography information, pictures, covers for Zep III & IV & a copy of an original Atlantic press release, and tour dates including the Preston & Bradford dates, both which were postponed until later the same month, printed inside the back cover. The actual cover is a mustard yellow colour and printed boldly with the band name on the front along with a 'Show Souvenir' and 'This Book Is...' text, whilst the back has just the band name. These unofficial programmes were produced in far fewer numbers than the official ones & the sellers also had to run the gauntlet of Messrs Grant & Cole ... The programme is in great condition with very light signs of wear & age and remains free from any stains, rips or tears - a fantastic early Zep item! 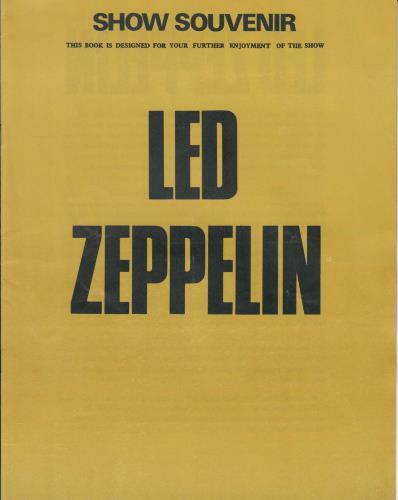 Product Information Led Zeppelin Show Souvenir - 1st UK tour programme.